A selection of various recent project examples. 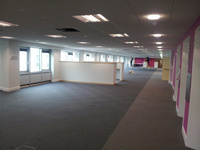 A series of projects comprising internal alteration and refurbishment works to provide a new customer service centre, open plan office facilities and new police accommodation. Externally a rooflight was provided over the central atrium/courtyard and fabric repairs undertaken to existing roofs. An industrial processing plant and associated office accommodation for a major steel fabricator together with site infrastructure works, procured under a design and build contract. A series of projects comprising the internal re-organisation and refurbishment of existing office accommodation and the provision of a new expanded customer services and reception area to ground floor. The works were procured under a formal partnering arrangement and undertaken on a phased basis to enable the building to remain in partial occupation and operational throughout. This project was undertaken for Hastings Borough Council utilising funding obtained from the European Regional Development Fund. The works were designed to improve the fabric of four existing industrial units and achieve cost effective enhancement of the energy and thermal performance in a way that was replicable on other industrial units within the area. 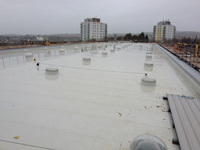 Works included replacement of the entire roof covering and insulation, rooflights and selected areas of damaged cladding together with insulation at the perimeter of the existing foundations and slab. The works were procured through a single stage competitive tender in order to meet the client’s strict procurement procedures. The selected contractor was appointed under the JCT Intermediate Contract with Contractor’s Design. The scheme has been replicated on an adjacent unit utilising many of the proposals incorporated within this phase. The construction of a five storey infill block to existing school accommodation to provide new classroom facilities together with internal refurbishment and alteration works to existing facilities and the provision of an enclosing canopy to external courtyard space. A major new build state of the art facility for a Sussex based independent school comprising theatre, recording studio, rehearsal rooms, music technology suite, teaching areas and catering facilities. 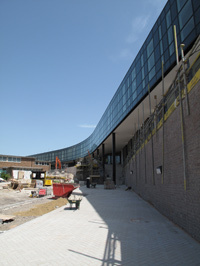 A new Academy facility at Falmer, Brighton to replace the previous Falmer High school, for Brighton and Hove City Council and sponsored by The Aldridge Foundation. This project was procured on a design and build basis under the Government’s national framework programme. 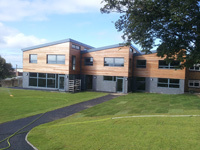 A two storey extension to the rear of the existing school comprising new classroom accommodation and ancillary facilities including internal alterations and site infrastructure works. The school remained operational throughout the works and this necessitated the construction of a temporary access road for site traffic. 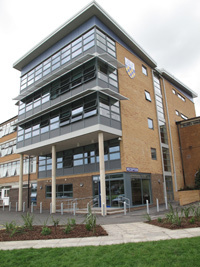 A three storey extension to the existing sixth form college providing additional teaching facilities and a new performing arts theatre with associated site works. The project was procured using a design and build contract. A new stand-alone house built in the grounds of an old Ministry of Defence fire station in Whitehill Bordon. 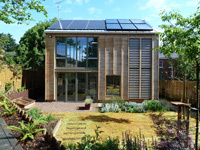 Built to Code for Sustainable Homes Level 5, the project included a diverse array of ‘eco’ solutions including solar and P.V. panels, trombé wall, winter garden, super insulation, rainwater harvesting, heat recovery and a thermal store. The scheme was undertaken as a demonstration project for the local authority to highlight the advances in ‘eco’ technology and how this could be put into practice in the modern home. A development of 13 residential units in Ashtead, Surrey for Sydney Simmons Homes, a registered charity, comprising the demolition of existing alms houses and the provision of 8 two bedroom flats and 5 two bedroom bungalows together with associated site works and parking facilities. The project was designed to comply with the Code for Sustainable Homes Level 4. The works were procured using a two stage tender approach with open competitive first stage and negotiated second stage and phased during construction to enable the decanting and relocation of existing residents. The project was procured using a two stage tender process and comprised a major external and internal refurbishment of the main house, including similar works to the principal outbuildings, and a new separate leisure building contract, together with site works and services. The Practice has also been appointed on several similar new build and refurbishment projects in the South East and London ranging in value from £200K to £14M. The phased redevelopment of existing and new residential accommodation comprising main house, Grade II listed Oast House and separate internal swimming pool building. High emphasis was placed upon sustainability including the provision of a dedicated energy centre, biomass boiler and solar photovoltaic panels. External site works included the formation of a natural swimming pool with reed bed filtration. 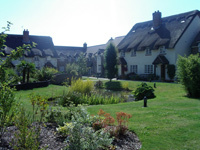 A two phase residential development based upon a rural “village green” design concept including traditional building features such as thatched roofs. The central green area is pedestrianised with vehicle access and garage accommodation being located to the rear of the properties. 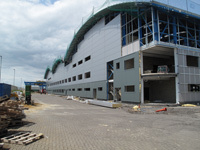 A construction management approach was used with individual trade/elemental contractors being appointed under direct contracts and coordinated by the construction manager. 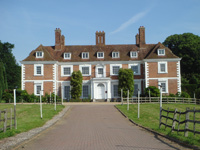 The complete refurbishment and extension of a Grade II listed manor house, lodge and ancillary buildings in East Sussex. Works included extensive external stone and flintwork restoration and re-roofing of the main property together with associated landscaping and site works. 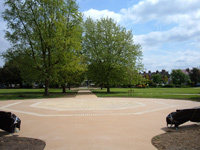 Projects have comprised refurbishment and upgrading works to several historic parks and associated buildings including soft and hard landscaping. Approximate project values ranging from £0.5M - £4M. F.T. 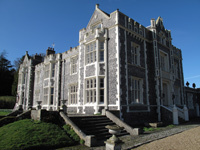 Allen acted as Quantity Surveyor for the phased external refurbishment and conservation of this international landmark building in Brighton, East Sussex. 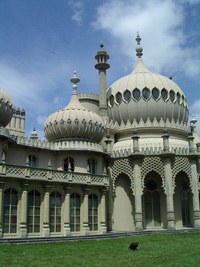 Works included extensive stone restoration and were undertaken over a six year period through a strategic formal Partnership in collaboration with Brighton & Hove city Council and a specialist contractor. Works to this Grade II listed building have included several individual projects over a number of years comprising external refurbishment and redecoration and internal alterations to create sympathetic and DDA compliant contemporary office facilities within a historic town hall. The building remained operational throughout. Works were procured using a variety of methods including formal partnering and framework options. Approximate individual project values ranging from £40K - £200K. 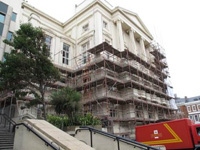 The project involved the complete refurbishment of the main roof to the iconic Grade II lift set above Madeira Drive in Brighton. Procured through the IESE Framework, the works were undertaken on a negotiated open book basis by a local contractor specialising in building conservation. 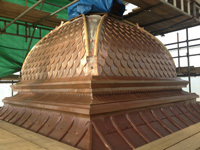 The roof was stripped back to existing timbers, many of which were replaced due to decay, and the roof coverings subsequently rebuilt using handmade copper tiles. Two of the missing copper griffins were re-cast and replaced and a major overhaul was completed on the existing weathervane. Specialist lighting was added to the project which had to be incorporated sympathetically and in accordance with the requirements of the conservation officer. The lift re-opened for public use in early 2013. 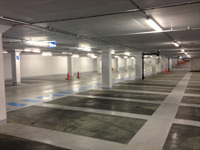 This project was procured through the Constructive Solutions Partnership with Brighton & Hove City Council to address the poor condition of both car parks, improve security and access and refresh the lighting and finishes to provide a more user friendly environment. 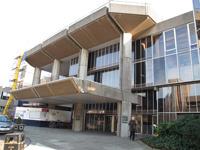 The scope of specialist concrete repairs was verified at an early stage in the project. By adopting a pro-active cost management approach and utilising the partnering attributes, solutions to mitigate a potential overspend were identified and successfully implemented. Both projects were finally completed £100,000 under the initial Agreed Maximum Price of £3.5M. 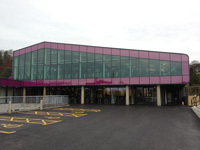 A significant re-development of the existing facilities at the Withdean Leisure Centre, Brighton comprising a new three storey concrete framed extension; conversion of two existing squash courts into three new fitness studios and a comprehensive internal refurbishment programme to the existing main building. The centre remained in full operation for the duration of the works. The works were carried out under the PPC2000 form of Contract utilising the Council’s Constructive Solutions Partnership and completed on time. The project involved the refurbishment of a disused Ministry of Defence fire station in Hampshire to form a new exhibition space, lecture theatre, community facility and office accommodation for the Eco-House team in Whitehill Bordon. The design aimed to recycle as much of the existing fabric as possible whilst utilising modern technologies to improve the environmental performance of the building. 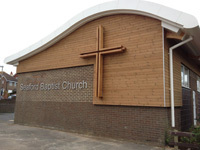 Undertaken on behalf of the Church’s trustees this project comprised of the full replacement of the existing profiled hall roof with a new curved metal system supported on glulam beams. 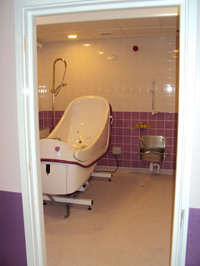 Internally adaptations to improve disabled access along with the installation of a new platform lift were completed. The local contractor was procured through a single stage competitive tender and appointed under the terms of the JCT Intermediate Contract with Contractor’s Design. All of the works were undertaken whilst the church remained operational and successfully completed on time and within the original contract sum of £310,000. F.T. 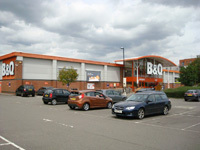 Allen was appointed to provide a building cost reinstatement assessment (RCA) for an existing 5,300m² DIY store in Aylesbury. The assessment and associated report were prepared for insurance purposes and completed well within the timescale required by the Client and their professional team. Completed in an operational nursing home for disabled ex-servicemen and women, these works were essential in providing high quality contemporary wash facilities for the residents. Undertaken in two phases, the works comprised a full strip out of existing facilities, reconfiguration of layout to meet current needs and installation of new finishes, services and specialist equipment.